Are you looking for a personal accident insurance policy? Having a personal accident insurance is good thing. You know why? Mostly, people die due to an accident rather than with natural causes. So, it is better to have a policy as an investment you can say. It will be helpful to you if you ever met with an accident and get hospitalized. Do you know which the best personal accident policies in India are? Here, we have listed all of them in detail. Do you know that accident cover is available in several forms? They are available as an optional rider with a life insurance policy, as an add-on policy for your motor insurance or house insurance, as a standalone plan, and as a group insurance cover from your company. First of all, before we talk about the best personal accident insurance policies in India, let’s have a look at what is personal accident insurance policy and how it works. These are the benefits provided by the personal accident insurance plan. Let’s have a look what exactly are the benefits. Accidental Death Benefit: In case if the death occurs due to accident, the Personal Accident policy would pay 100% sum assured to the nominee or beneficiary. Temporary Partial Disability Benefit: In this case, the person is not able to work for some weeks or months due total disability. In such cases, the policy holder will be given a percentage of sum assured like 20% of sum assured or a fixed periodic payment for few weeks. 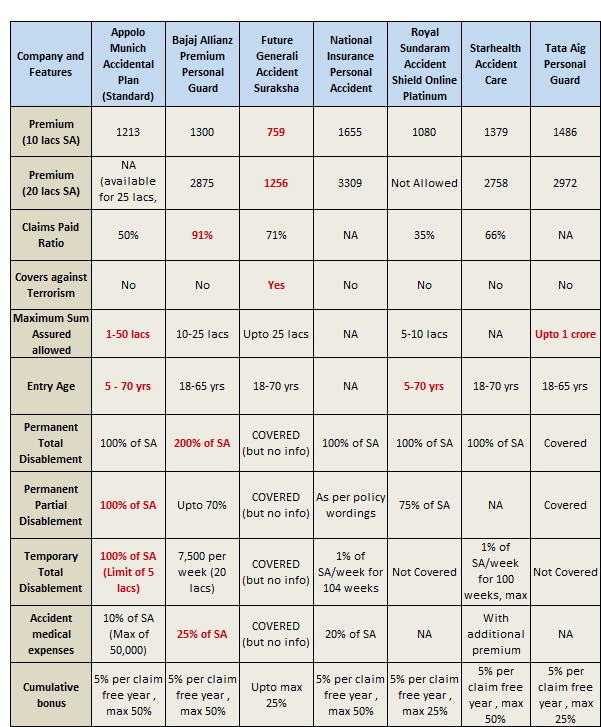 Here are the best personal accident insurance policies in India. The policies listed above are the best personal accident insurance policies in India for which you should go. What are you waiting for? Choose the best and most convenient policy for you and get benefits from the company. In the above table, you can get all the necessary information about the best personal accident insurance policies in India. if you are looking for cheap accident insurance policy than you can buy PM Jeevan Suraksha Bima Yojana which gives up to 2lac cover for just Rs.312/year premium. Ask us a question in case of any doubt by leaving comment below in the comment box!